So, I took a class. I mean that’s where it starts right? That’s where you take action, show up and learn how to do something. One big reason I even started this website is because I don’t have a hobby. Way too many years spent earning instead of learning a new skill for my free time. So, I took a class. Driving down Northwest Highway in Dallas, my honey spotted a store in a strip mall called Maker’s Connect ~ Local Handmade Crafts. An interesting name that let us know that they serve artists and supporters of artists. I immediately looked them up on my phone to check them out. Makers Connect is a consignment store for artists, crafters, DIYers who are interested in making money from their creations. Now there are plenty of artists out there who want to keep all of their creations. My Aunt Irene loved to paint and her walls were filled with her work. She gave away a few pieces but they mostly served to decorate her home. Makers Connect is for those who want to profit from their original work. But not only that, this business is there to help others learn. They offer classes to those of us wannabes still searching for our passion. I was drawn to the Metal Stamping page on Hobsess since I found this hobby and knew that at some point I wanted to try it. Fortunately, this class was offered at Makers Connect. I showed up ready to learn. Greeted by Chris Unruh, the owner and instructor, I knew immediately it was going to be a fun night. AND IT WAS! The class was small – just how I like it. In a small setting it is very easy to get your questions answered and talk to others about real time learning. As a former educator, I know how important access to key information is. Equally important, she served drinks! My Work Station – I’m sorry you have to see my old lady glasses there! 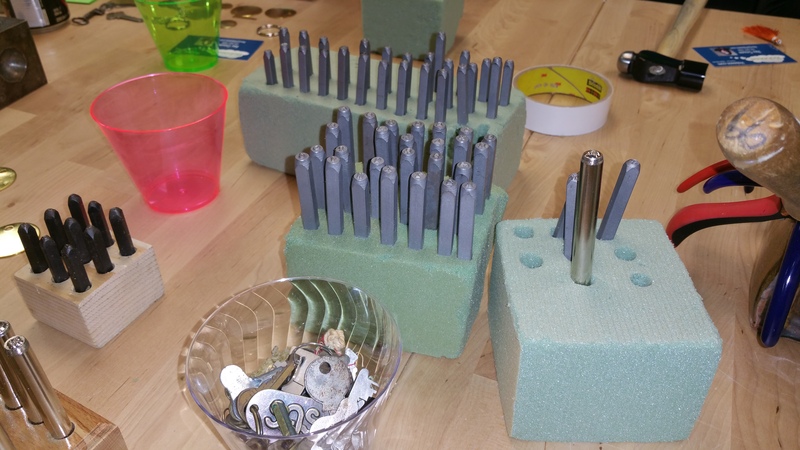 Each student had a metal block, a mallet, various sized pieces for stamping and access to uppercase and lowercase letters, decorative stamps for special effects, and other charms. We could make key chains or pieces ready for a bracelet or necklace. Let me tell you from a closet creative, it was a little intimidating. I should have perused my Pinterest board on Stamping on Metal before leaving and snagged a few meaningful sayings to copy but I didn’t think of it until just now. 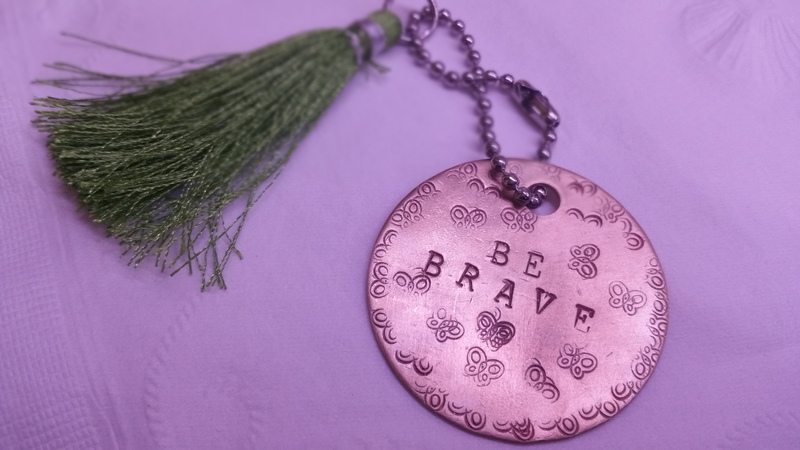 So I had a brief moment of “duh” until I remembered a quote on a bracelet that my sister Venessa gave me many years ago – Be Brave. I was ready to pound it out! Instructions: You can hit it once, even twice but NOT thrice! I was encouraged to draw it out first so I did. I tend to want to do first and then plan later because I don’t want anything to slow me down. Not always the best approach, I know! As I am pounding out Be Brave, I decided that I will actually give my creation to Venessa. I know she will be so excited about this! As exciting as receiving a finger painting from a 4-year-old! Similar skill level. I taped down the round piece so it wouldn’t wiggle during the whacking but what I found challenging was getting the letters lined up and spaced perfectly. Some letters seemed dark and some light and all seemed a little off. Even though I have given up the illusion of perfectionism that haunted me as a young person, sometimes it creeps back in. 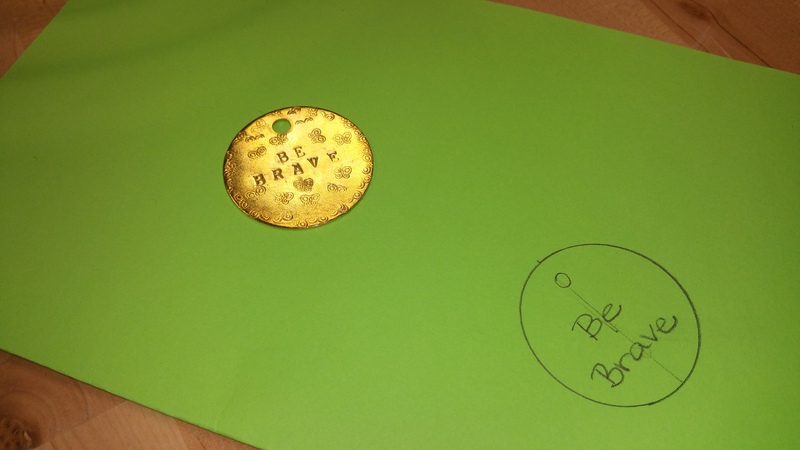 I had to give these ideas a few whackings along with my brass plate. You cannot expect your first attempt at trying something new to be perfect. Get over it. It takes practice to become good at anything. Since my very first keychain is going to Venessa (meaning butterfly) I decide that pounding decorative butterflies everywhere would be appropriate. So I started going crazy with the butterfly stamp. I have to tell you that there was a lot of love and aggression happening in this next step. 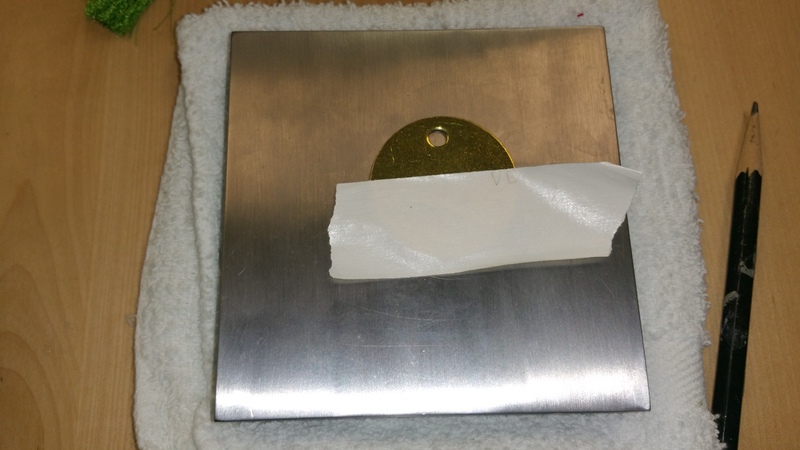 Somehow, I couldn’t get a good whacking on the stamp to the metal. Consequently, the décor is more body parts of butterflies rather than lovely flying creatures that I had envisioned. But it was made with love. Same technique. Same result. Instead of butterflies, I pounded hearts. OK, partial heart parts. I know now why I got pieces instead of the whole. Stamping metal takes patience. I was whacking butterflies and hearts like I was playing whack-a-mole. I think I will do much better next time just by slowing down. For my final piece, I decided to go simple. Mainly because artistic crazy produced two other key chains that looked like I was blindfolded when I made them. 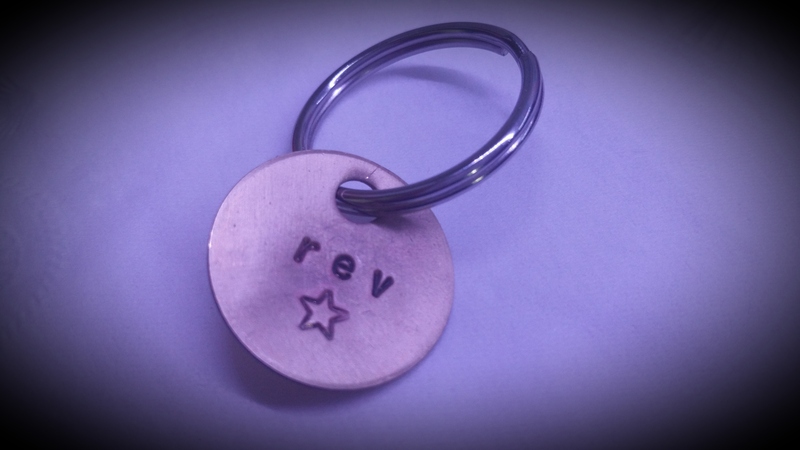 I pounded out “rev” and added a star. I have an attachment to stars. I keep reaching for them. I keep trying to be one. I keep trying to shine that brightly. I love them. I want to encourage anyone living in the Dallas area to get to Makers Connect and take a class. You can find them here. If you are like me and not used to creating anything, this is a fantastic place to learn. 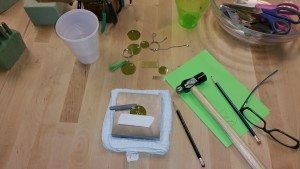 If you cannot make it to a class and are ready to try Stamping on Metal yourself, you can click here to get started. Stamping on Metal takes practice so be patient with yourself while learning. It’s important to find a good teacher, resources or training to find early success. Personalizing pieces suddenly turn whatever you make more meaningful. 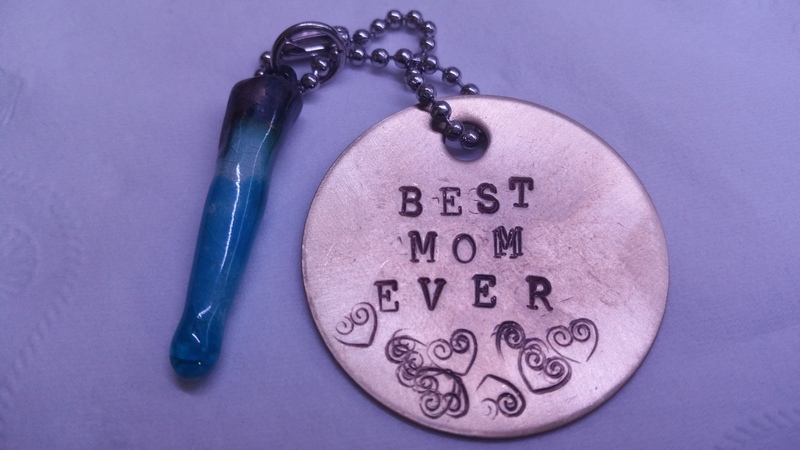 I was constantly reminded of what a great sister and mom I have as I was creating their key chains. 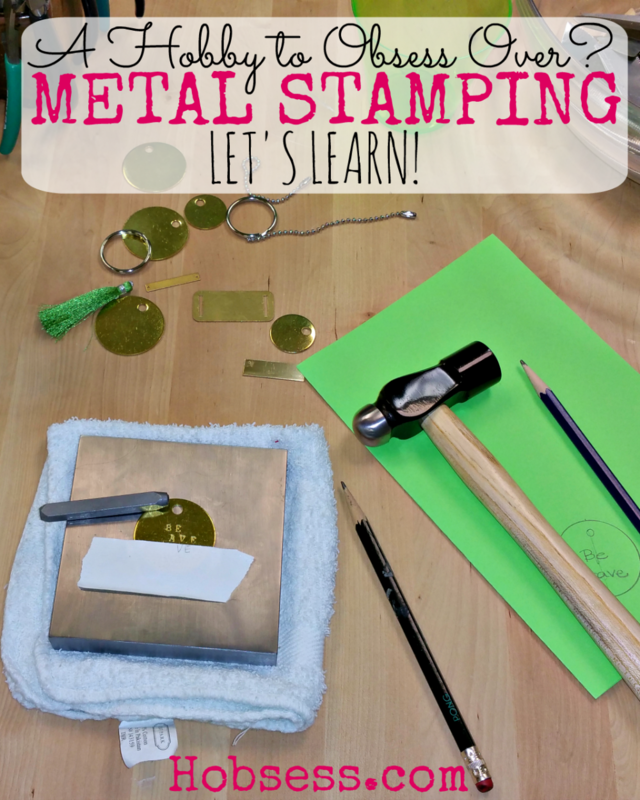 Have you ever tried stamping on metal? Is this your hobby or business? Are you willing to try? Wow! Thank you so much for this post! 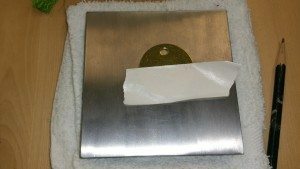 I’ll be teaching a metal stamping class and for weeks now I’ve been scouring the web for insight from a learners perspective; until finding your post I’d been unable to find ANYTHING. I love how you incorporated what to expect from the class along with supply lists and links to classes and online resources. Any tips for me as a new instructor? I just received my VERY special key chain! I love it and I love you! I’m so proud of your eagerness to learn new things! You are an inspiration! Fantastic! I can’t wait to get my new key chain! Looks to me like the sum of all the butterfly parts equals beauty. Wow, what a wonderful piece you’re written, Rev! I really appreciate your kind (and funny) words. We sure hope to see you again soon.